Dexter and I love finding unique dog-friendly attractions and activities. 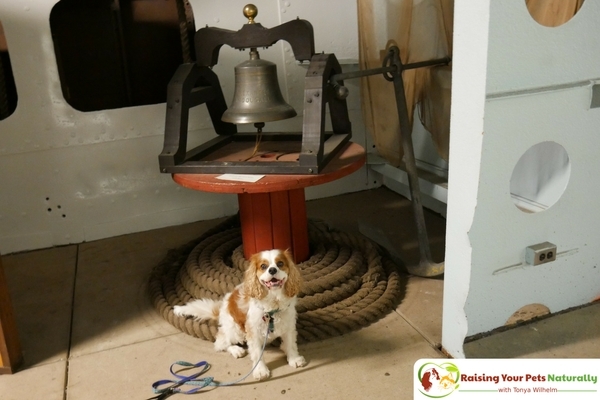 When we stayed in Duluth, Minnesota, we knew we had to cross over to Wisconsin and look for some fun dog adventures, and boy did we find one at the SS Meteor Whaleback Ship Museum. I contacted the museum prior to our arrival to ask if Dexter would be able to join us, and we were given the green light. First, a little history of the museum. The SS Meteor is the last remaining whaleback freighter designed by Captain Alexander McDougall. The SS Meteor was built right in Superior, Wisconsin. The earned their name “whaleback” because of their innovative cigar-shaped steel hulls that rode low in the water when fully loaded with their cargo, giving the impression of a whale’s back. In 1972, the Meteor officially landed in Superior and is now permanently land-berthed on Barker’s Island. She ended her shipping career as the SS Meteor, after carrying a variety of cargoes over the years, including iron ore, grain, sand and gravel, cars, and oil. Guests are able to tour the ship from the pilot house to cargo holds. 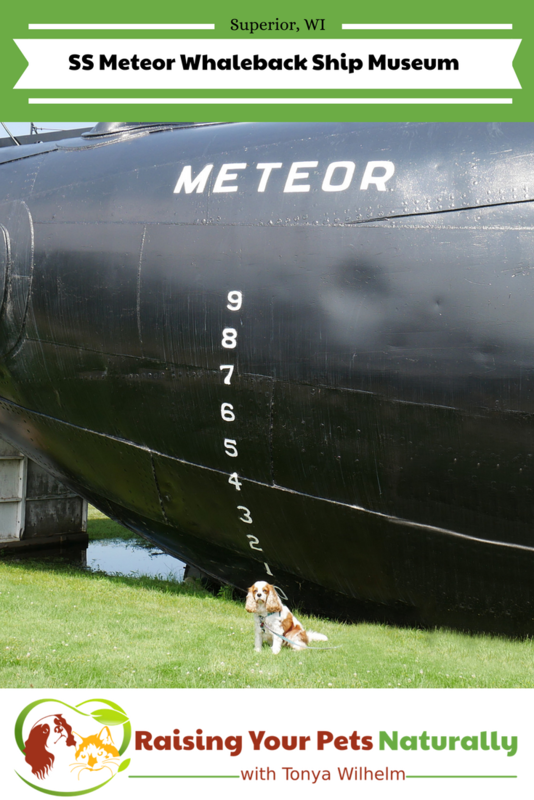 The SS Meteor Museum also features exhibits on Great Lakes shipwrecks and the history of shipbuilding in the Twin Ports. 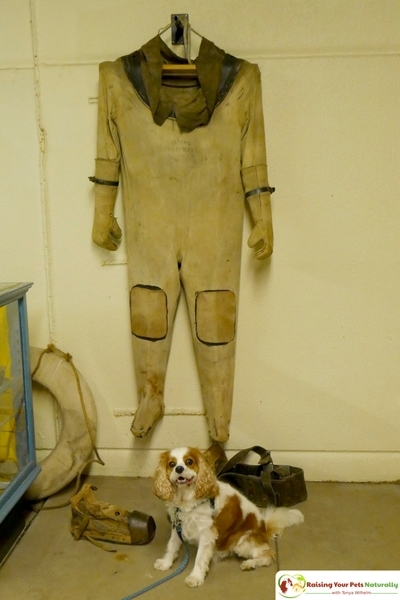 Dexter and I enjoyed the bottom half of the ship’s museum and did not take the guided tour. However, my step-dad did, and loved every minute of the tour. I was a bit worried that the steps would be too steep for Dexter and the top of the ship too hot. But Dexter and I had a great time looking at all the amazing pieces in the museum. This dog-friendly adventure was a great find! 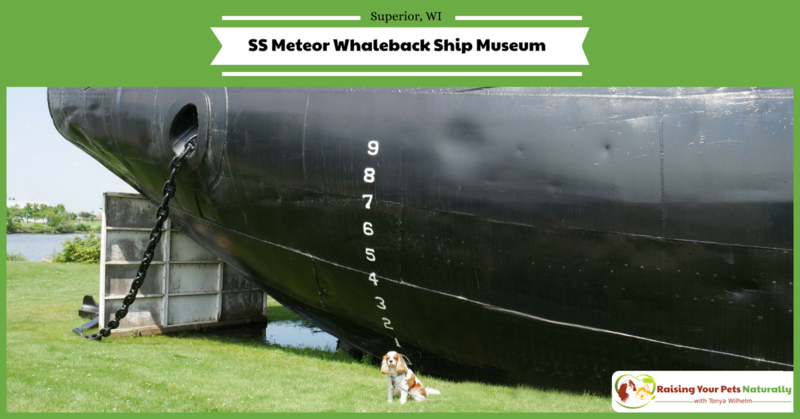 If you find yourself in Superior Wisconsin, I highly recommend checking out the SS Meteor Whaleback Ship Museum. Tell them Dexter sent you! Oh, I love the idea of traveling with my dog; she, on the other hand, does not love to travel. I’m so happy to know there are more and more places that are becoming dog-friendly. Oh, I’m sorry. Yes, sometimes dogs have a few issues that make them not want to travel. It is good to find places that you can bring your dog with. That way they dont get lonley. I totally agree. Dexter always goes on our vacations and finding fun things to do is a must. Dexter looked like he has a blast! Thanks for sharing a great article! You bet. Dexter loves traveling and exploring. What an awesome experience for you and your adorable dog! How unique to experience it together! I love the idea of finding dog-friendly outings! Thank you, Lauren. It’s so fun finding attractions that both Dexter and I can enjoy. I see things I never would have considered if it wasn’t for the fact he could go! First of all, Dexter is just too cute! I also love all of your suggestions! Great post! Thank you Elicit. We always have so much fun. Thank you. Dexter is a very happy boy. He loves traveling and checking out new adventures. I absolutely love Duluth! There is so much to see and do! I have never been to the Whaleback and I know my son would love it, so we have a new item on our list next time we go! Fantastic! I’m so glad to share such a great attraction. Duluth was just across the bridge. Such a great area. What fun! I don’t have dogs, but I know that traveling with them is all part of the fun, and so is finding places like this that are dog friendly. What a neat ship to explore. 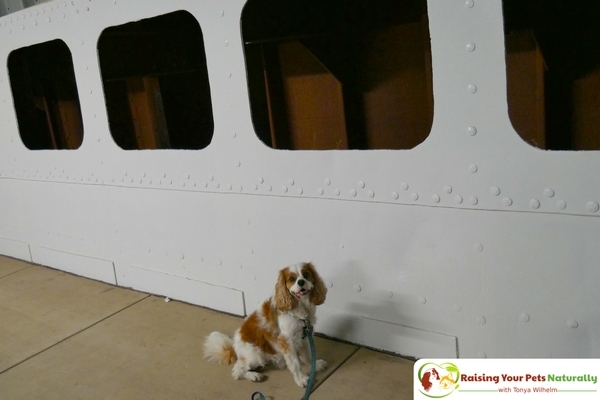 It’s fun to be able to travel with your dogs, and they look so well-behaved! It must be so much more convenient to take the dogs with you instead of having to board them. Thanks, Marysa. 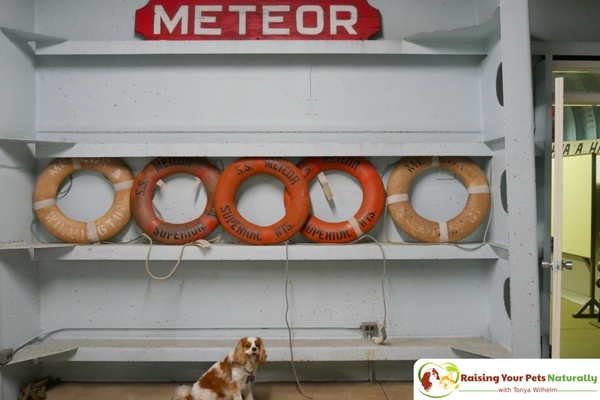 The SS Meteor was such a great museum to visit. Yes, I only visit places Dexter is welcome to join in on the fun. My daughter has a dog that is deaf. She takes him everywhere she goes. It’s nice to have options of great places to go that are pet friendly. What an adorable post. I have always wanted a cocker spaniel and this was a great outing fr your pup! What a great place for dogs! I am sure dog lovers will love this when they go to Wisconsin! It was so much fun. I love finding new and interesting places that Dexter can join me. I love the idea of travelling with my dog. It is great that more places are becoming dog friendly. That looked like a fun experience. Hi, Holly. Me too. It’s such a great experience to visit new destinations and attractions with Dexter. Thank you, Stephanie. Dexter is a special boy. Your dog is the cutest! Love that your area has the dog friendly experience!